When the call went out on Twitter for bloggers to possibly receive and review Charmian Christie’s new cookbook from Harper Collins I immediately sent off an email in the hopes I would be lucky enough to be picked. From the first page I was in love with The Messy Baker. It starts off with a little girls view of her mother in the kitchen, you can see why she is in love with cooking! Then it moves into gadgets and ingredients which is super handy not only if you are a first time baker but I also learnt a few things and I have been baking for over 20 years! There is a nice measurement table and even an emergency substitution section in case you run out of or are short an ingredient. Some recipes allow you to use cheaters ingredients if you so choose or go completely from scratch! From flaky to sloppy, smudgy to drippy and everything in between you will be sure to find many fantastic recipes to try. 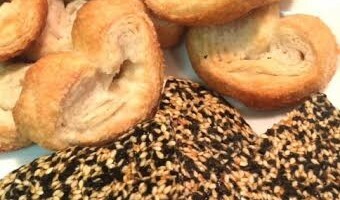 The first recipe I tried was the Vanilla – Scented Palmiers. It was a great choice as I had everything on hand that I needed. That jar of vanilla sugar I made 100 years ago as waiting for the perfect recipe. Plus I have always wanted to try Palmiers. I am a huge fan of anything flaky and these do not disappoint. So good! You will find the recipe for those in the Flaky section of the book. With chocolate or without, these are fabulous and you can’t stop at one. The other recipe I tried this week comes from the Gritty section which quickly caught my eye. Actually many did but I had to try the Back an White Sesame Snaps first. Again, I happen to have everything needed only because I seen Black Sesame seeds in the store a few weeks back and thought they were cool, I bought some. Visually these are spectacular! They are easy to make and are as good as the ones we all ate growing up. 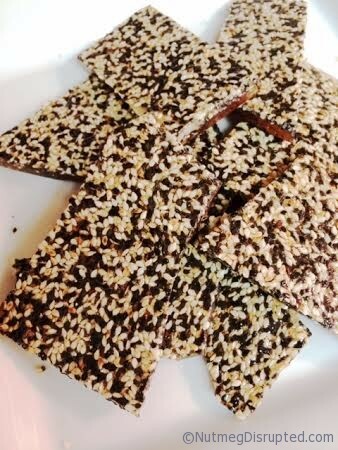 The black sesame seeds add an earthy flavor which works very nicely with the honey. There are so many recipes in this book I want to try I wish I had more time this week. I assure you there will be many more posts on recipes from The Messy Baker in the weeks and months ahead. I already plan on making the Sweet Potato Samosas, The Smoky Mushroom Crepes and the Peppery Pear and Smoke Gouda Dutch Baby. But now I must pack as I head off to Vancouver in the morning for the second annual Food Bloggers of Canada Conference! But before I go I want to announce my very first give away here on Nutmeg Disrupted. 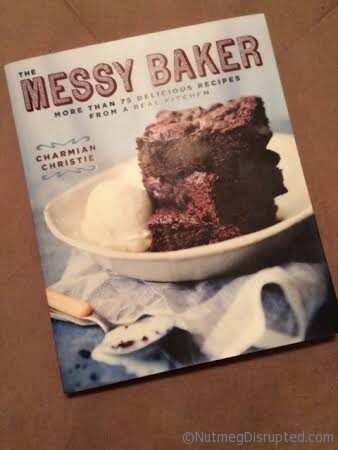 I have a copy of The Messy Baker to send out to one lucky reader! Enter below an also share my Facebook page for an extra entry! Thanks everyone! Good luck and Happy Baking. Previous Post - Previous post: Midnite Mass The Great Collaspe 2007 Festival Of Trees Grande Prairie. You’ve reminded me that it’s far too long since I visited Charmian’s lovely blog. Such a lovely book – and you’ve reviewed it so beautifully. Pie crust is always a bit of a mess. At least you remembered your apron. I get halfway through then realize that’s what I forgot. Happens 98% of the time. Oh man! Now that’s a mess. The mess in the oven had to be the worst part. I probably would have cleaned it up then had wine! Biggest kitchen mess? Making pie dough from scratch and I had flour in the mixing bowl, on the table top, on the floor and on my apron. The rest of the counter top was filled with utensils, sugar, butter and more!! Cleanup took just as long haha! Biggest kitchen mess? That time I forgot to put flour in the chiffon cake batter, and it leaked out of the two-part tube pan into the oven, and onto the floor and counter. Big oops and total kitchen fail. So, I started again!